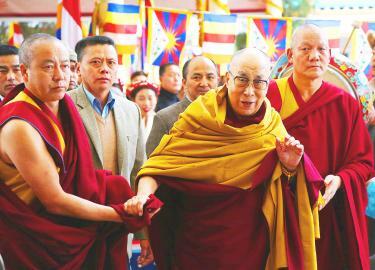 The Dalai Lama, center, arrives at a Long Life offering prayer at the main Buddhist temple of Tsuglagkhang, near the town of Dharamsala, India, on Feb. 27. Tibetan advocates yesterday joined New Power Party (NPP) Legislator Freddy Lim (林昶佐) in launching a petition to invite the Dalai Lama to visit Taiwan this year, and urged civic organizations, religious groups and the public to help make it happen. 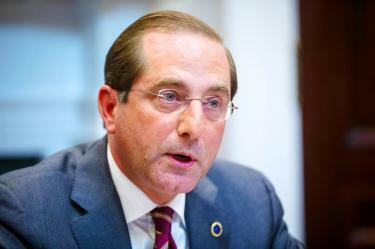 US Secretary of Health and Human Services Alex Azar speaks during healthcare pricing roundtable in the White House in Washington on Jan. 23. US Representative Ted Yoho on Friday sent a letter to US Secretary of Health and Human Services Alex Azar, urging him to visit Taiwan next month to attend an international workshop on public health and advocate for Taiwan’s participation in the upcoming World Health Assembly (WHA). Tomorrow Tibetans around the world are to mark the 60th anniversary of National Uprising Day, commemorating the day when hundreds of thousands of Tibetans surrounded Norbulinka Palace in Lhasa to protect the Dalai Lama against a possible Chinese kidnapping attempt: It was a peaceful protest against the Chinese Communist Party’s (CCP) rule over Tibet and its harsh occupation by the People’s Liberation Army (PLA). 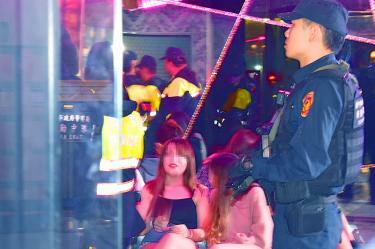 Armed police officers raid the night club X-Cube in Taichung on Wednesday. Premier Su Tseng-chang (蘇貞昌) yesterday reiterated a warning to late-night entertainment proprietors and local police to better combat street fighting after a spate of violence in the past few weeks. Regardless of what Taiwan’s future looks like, and regardless of whether the Democratic Progressive Party (DPP) salvages the situation, this statement will become a classic. “When I hear the word ‘culture,’ that’s when I reach for my revolver.” So goes the mistranslated and often misattributed line from German playwright Hanna Johst’s Schlageter. Taipei Mayor Ko Wen-je (柯文哲) received a death threat in a telephone call on Friday last week, Taipei City government spokesman Sidney Lin (林鶴明) said yesterday.